Armchair fiction presents extra large editions of the best in classic science fiction novels, complete with original illustrations. 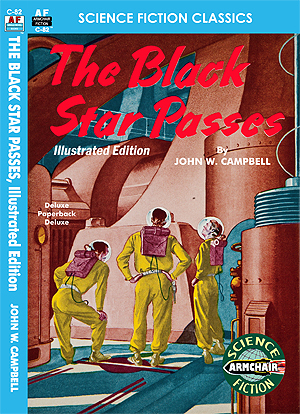 Here’s a great illustrated edition of that space opera classic, “The Black Star Passes” by one of the early masters of science fiction, John W. Campbell. It was three against the stars! A sky pirate armed with superior weapons of his own invention… First contact with an alien race dangerous enough to threaten the safety of two planets… The arrival of an unseen dark sun whose attendant marauders aimed at the very end of civilization in this Solar System… These were the three challenges that tested the skill and minds of the brilliant team of scientist-astronauts Arcot, Wade, and Morey. Their initial adventures are a classic of science-fiction, which first brought the name of their author, John W. Campbell, into prominence as a master of the inventive imagination. Campbell would, of course, go on to further greatness as the longtime editor of Astounding Stories and Analog.